There are currently 90,736 users on this website. I have multiple coins to upload and ask about however, I'm going to start with one in particular. Can anyone please let me know what this type of error would be referred to as being? 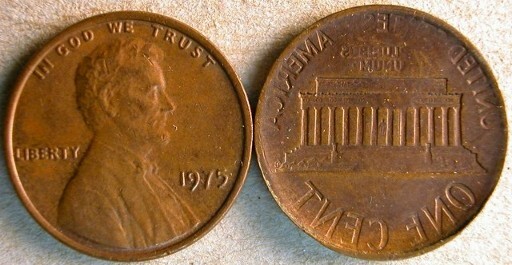 It's a 1971 Lincoln penny and on the Reverse side has a second print on it. 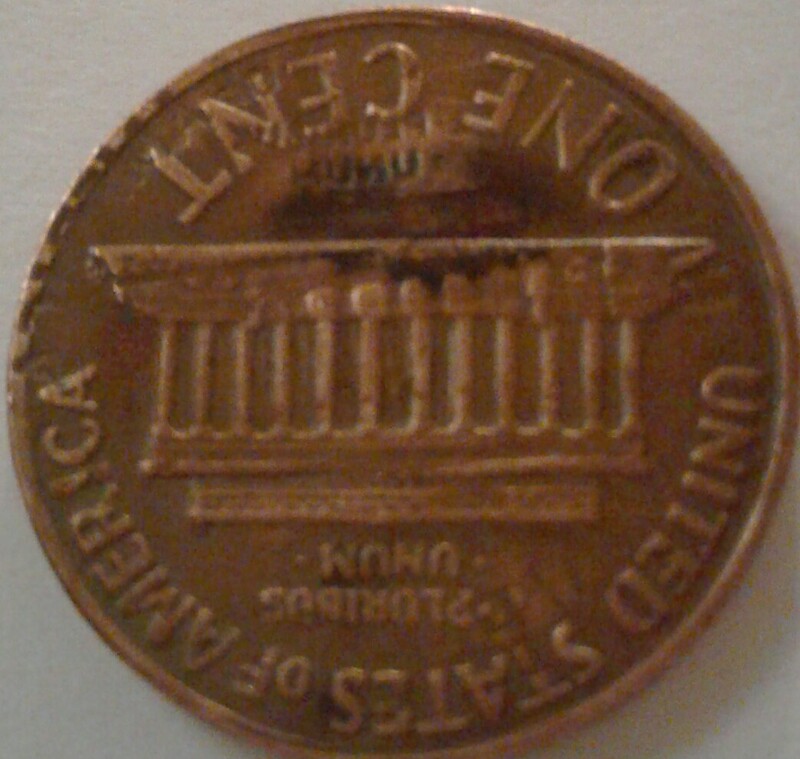 Just above ONE CENT is a BACKWARDS E PLURIBUS UNUM also on the outer rim their are markings which would be letters of what the other coin was. Is that to imply that it isn't a mistake done at the mint or that someone else did this? Unfortunately not an error. Somebody crushed the coins together to transfer the design from to the other. Mama Mia , that's not a mint error . To CCF! This is not a legitimate error coin. It's a Vise-Job as Crazyb0 said. It's Post Strike Damage ( PSD), meaning that this happened after it left the U.S. Mint (it's impossible for this to happen inside of the U.S. Mint). It's worth face value, since it's just a damaged coin. 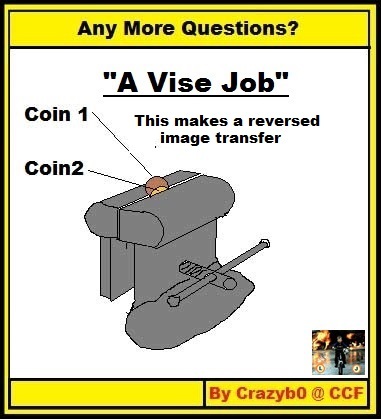 Yep, vise job like Crazyb0 mentioned. Post minting damage, not an error. Just a good old vise job. I wonder why these seem so common? A brockaged coin and normal coin, side by side. If a planchet were to be fed on top of and straddle both coins, the resulting error would present a first-strike brockage and a first-strike counterbrockage next to each other on its reverse face. 6) A brockaged coin is struck into another brockaged coin, with the two brockages facing each other. Each coin will carry a counterbrockage of the other. Where the brockages are in direct contact, the counterbrockage will overlie the brockage. This thought-provoking combination has not been encountered. 7) A brockaged coin is struck a second time, off-center. Then a planchet is struck into it. The coin that results will have a brockage side-by-side with a counterbrockage. This error has not been encountered. Permutations: The brockage could be on the obverse face or the reverse face. The planchet would respectively rest on top of, or beneath, the brockage. 8) A coin receives a second, off-center strike while overlapped by another coin. Then a planchet is struck into it. The second, off-center strike leaves a brockage on the part of the coin that was in direct contact with the second coin. The image below shows such an error, a double-struck 1972-D nickel with a first-strike brockage of the obverse design on the reverse face of the second strike. If a fresh planchet were to be fed beneath this double-struck coin (or if this coin was fed on top of a planchet), the result would be a coin with a brockage and a counterbrockage that lie side-by-side. Some brockaged elements would likely persist within the counterbrockage. This error type has not been encountered.